Country Inn Resort in Mussoorie offers one of the best views in the hill station, Overlooking the magnificent Doon valley. Country Inn Resort in Mussoorie belongs to the Country Inn Hotels and Resort Chain in India. Country Inn hotels and resorts combine luxury, comfort and beauty to create spaces uniquely meant for you and your family. Check out other resorts from Country Inn Hotels: Country Inn Corbett, Country Inn Bhimtal, Country Inn Mussoorie, Country Inn Sattal . Mussoorie Country Inn resort is located away from the maddening crowds of the Mall, the resort offers a refreshing experience in the lap of nature. The resort is 37 Kms from Dehradun on Mussoorie Dehradun Road. 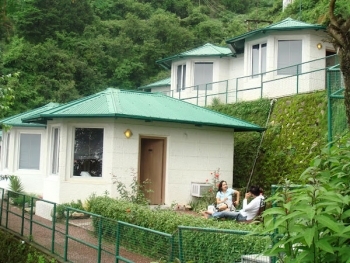 Country Inn Resort in Mussoorie has 13 double rooms offering a fabulous view. The well-spaced, well-appointed cottages offer a comfortable stay to the guest. Country Inn resort in Mussoorie has a multi cuisine restaurant. New Delhi IGI is the Nearest international airport 300 Kms, from Mussoorie Country Inn Resort. Dehradun to Country Inn Mussoorie is 37 kms by road. Taxis are readily available outside the Dehradun railway station.